Are you in charge of security for a healthcare facility? 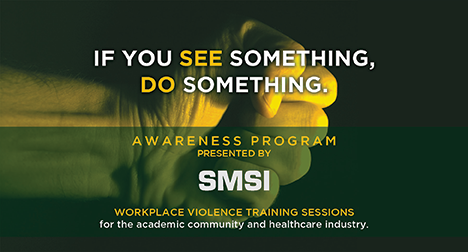 SMSI has developed a security awareness training program for hospitals that fulfills the motto: If you see something, do something. In less than two hours, we will empower employees, from housekeepers to RNs, with the basic tools of threat recognition at the incipient phase, the skills required to be an effective witness and an action plan commensurate with their various job descriptions. Download the PDF for more information on this unique opportunity. Call (805) 499-3800 today to schedule your session! Download the PDF for an intro on our Security Assessments. Download a copy of our Workplace Violence Workshop Flyer.